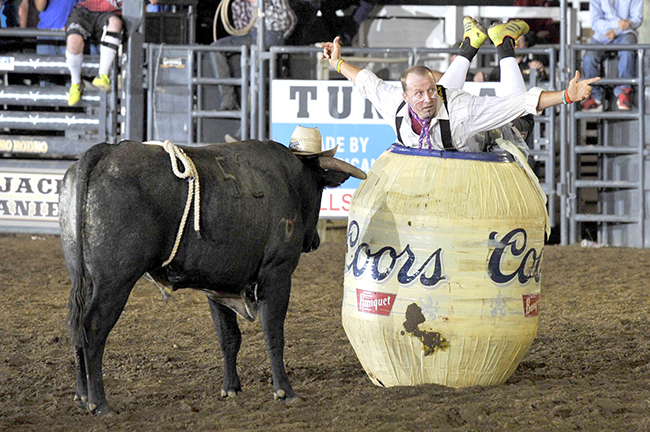 GOODING, Idaho – Ross Hill is a veteran bullfighter who has a few tricks up his sleeve. He earned his spot in Saturday night’s championship round of the Bullfighters Only tour event in association with the Gooding Pro Rodeo, then pulled out some old-school items from his toolbox to pull off an 89.5-point fight to win the championship and $3,000. It was there, though, that Hill shined while matching moves 12x Fighting Bulls and Costa’s AK-47. The quick little black bull was true to his name, spitting out rapid shots that the Alabama bullfighter countered. When the time came, the 33-year-old Hill pulled the animal toward the barrel and its inhabitant, barrelman Justin Rumford. “I like to get some showmanship out of the barrel,” Hill said. “I watched the four guys go before I went, and I was on the fence next to the crowd, and they were loud the whole time. The loudest they got was when the bulls hit the barrel. That, oftentimes, is the difference in the Bullfighters Only events, which serve as a world-class showcase of the sport’s top talent. Hill has 10 years of bullfighting under his belt, and it shows. With half the score coming from the animal, having a talented athlete on the other side of the equation is vital. All the men in Gooding experienced that with 12x Fighting Bulls. In a field that included BFO No. 1 Nate Jestes and three other top bullfighters in Evan Allard, Justin Josey and Zach Call, only Hill and Burns made the short round. That’s because Burns put on a solid performance in his inaugural Bullfighters Only competition. He won the opening round with an 88-point fight. “I’m just excited to get my foot in the door,” Burns said. “It seems like the BFO is really taking off, and I just felt lucky to be part of it. He fared fairly well for not having been part of a freestyle bullfight in several years. When the ink dried, though, Hill took the top prize. He wasn’t able to put it into any type of season perspective, but there’s a reason for that. With the victory, Hill pushed closer toward the top three in the BFO standings. He sits fourth with just eight events remaining in the regular season, but he’s only $1,300 behind the leader, Jestes.